I’ve been very busy lately between holidays, preparing for classes, and recovering from the plague. I’ve barely had time to play, let alone write blog posts. In fact, I really don’t have time to write this blog post, but it felt important enough that I made some time. But only enough for a quickie. Glyph of the Alabaster Shield now increases Shield of the Righteous‘ damage by 3% (down from 10%) per stack. The third change there is just a DPS nerf, which is probably warranted simply because Alabaster Shield was far and away the best DPS glyph we could use while tanking (Harsh Words is an even larger gain, but not really advisable while tanking anything relevant). Not much point discussing that change further. I think the biggest reason haste is weak this expansion is entirely unrelated to class mechanics. It’s actually fairly simple: the rating conversion got nerfed, hard. A simpler fix would be to modify that rating conversion for prot paladins, either directly in the game data or (more likely) indirectly by increasing the rating boost granted by Sacred Duty. If Sacred Duty suddenly increased haste from gear by 30% rather than 5%, haste would be back in business. In later tests on Maintankadin (with a significant amount of assistance from Ashaton), we determined that even 30% wouldn’t quite be enough on its own. Sacred Duty would need to be around 40% to push haste ahead of mastery under all circumstances. It seems like Blizzard agreed. Haste must have been underperforming for a lot of classes to warrant an 11.1% buff to the rating conversion. Combining that with a 30% Sacred Duty is effectively the same as a 44.44% Sacred Duty, more than enough to push haste up to be our most preferred stat. So our attunement finally matches the stat we want. This can be placed anywhere in the simc file or the text of the Simulate window. As you can see, haste performs much better post-hotfix than before, at least according to scale factors. That said, scale factors are notoriously unreliable because they rely on the assumption of local linearity, which isn’t often obeyed. For example, we’ve seen before that haste’s value can be all over the place with Seraphim because of odd breakpoint interactions. It’s far more reliable to look at scaling plots, which is why both of those sims contain said plots. Let’s look at those. Scaling plot for Holy Shield + Sanctified Wrath, pre-hotfix. To read this plot, you have to understand what the sim is doing. It’s running a bunch of simulations with +X of each stat and plotting the result. Thus, the line for bonus armor represents the result of a bunch of sims with -500, -450, -400, …, +400, +450, +500 bonus armor artificially applied. It plots the results of those sims as a continuous line. Since adding bonus armor reduces your TMI (making you more survivable), this line has a negative slope – in other words, it goes down from left to right. The steeper that slope, the better the stat is at reducing TMI and thus the better it is at helping you survive. So in summary, the closer to horizontal the line is, the worse the stat is; conversely, the steeper the line is, the better the stat is. It’s clear here that bonus armor has the steepest slope, which is why it generates really large (negative) scale factors. That’s why we covet bonus armor items so much. The yellow line for mastery is the next-steepest, and as we know by now mastery is our dominant stat when we’re using Holy Shield. The rest of the stats have slightly shallower slopes, and the absolute worst of them here is haste. This is how we know haste is the worst, even if the scale factor calculations occasionally suggest otherwise. Local fluctuations can cause an anomalously high scale factor when you’re only looking at ranges of +/-175 stats, but if you generate a plot like this you’ll see the long-term behavior of each stat very clearly. Generally speaking, that long-term behavior is what you care about, because a variety of factors (variable latency, player reaction time, player error, having to break rotation to do other things, time off target, etc.) tend to smooth out the local fluctuations you see in simulations. 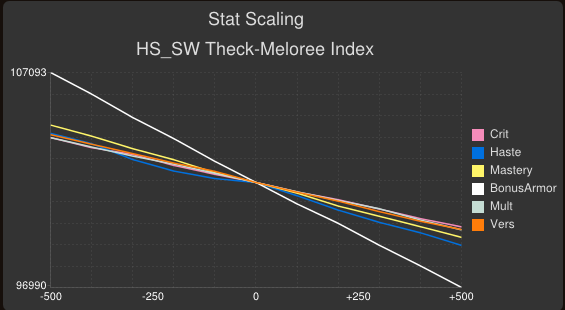 Scaling plot for Holy Shield + Sanctified Wrath, post-hotfix. We actually see a local fluctuation in the haste curve immediately to the left of zero, which would lead you to believe that haste is still bad. But if you look at the whole plot, you can easily infer that’s not the case. Above zero, the slope of the plot is much steeper, second only to the bonus armor line. And if you keep looking farther in the negative, you see that the haste line gets steeper again. If we continued this plot for more negative values, we’d see the haste line catch back up to (and overtake) mastery. Scaling plot for Holy Shield + Holy Avenger, post-hotfix. The haste line is very clearly the second-steepest here, putting it solidly ahead of the other secondary stats (except bonus armor, of course). Scaling plot for Seraphim + Holy Avenger, post-hotfix. Scaling plot for Seraphim + Divine Purpose, post-hotfix. Haste is pretty clearly ahead of the pack here. Again, I think this long-term behavior is what we care about with Seraphim simply because it fluctuates so much based on somewhat questionable breakpoints (i.e. how many GCDs or ticks of X or whatever else happens during the fixed 15-second Seraphim buff). In any event, this change pretty clearly accomplishes what it set out to do. Haste is going to jump from last-place into first-place amongst the non-bonus-armor secondary stats. For pretty much every talent selection, you’ll want to prioritize haste. What you go for after that will depend on your talents – with Holy Shield, you may favor mastery, with Seraphim you may favor critical strike. Though a haste/mastery focus won’t serve you poorly for any talent combination, so if you want to be able to swap back and forth between talents freely that may be the most versatile strategy. DPS scale factors for Holy Shield + Divine Purpose, post-hotfix. DPS scale factors for Seraphim + Holy Avenger, post-hotfix. As you can see, this change also vaults haste to the front of our DPS priority. That “to 50%” is important now that we’re getting so much haste from Sacred Duty, so it’s worth considering that 50% haste cap in more detail. Because the GCD is capped at 1.00 seconds, there’s a limit to how much haste is useful. After we reach 50% haste, it stops reducing the GCD of abilities affected by Sanctity of Battle, though the cooldowns of those abilities are still reduced. However, the majority of haste’s value comes from that GCD reduction. This means we only want enough haste to get us up to 50%, because anything after that is better off as a different stat. There are two raid buffs that increase our haste multiplicatively. The first is the 5% haste raid buff, and the second is Heroism/Bloodlust, which gives 30%. To figure out how much haste we want, we need to account for both Sacred Duty and those buffs. If we have X haste rating on our gear, it will turn into 1.30*X haste rating on the character sheet. So for example, 1000 haste rating from gear (or from Seraphim) will show up as 1300 rating on the character sheet. We’d divide that by 90 to figure out how much percentage that gives us – in the case of Seraphim, it’s 1300/90, or 14.44% haste. To figure out how much haste we have after raid buffs, we’d have to convert that to 1.1444 and multiply by the value of the raid buff, which is 1.05. So if we started with no haste on gear and just Seraphim active, we’d end up with 1.1444*1.05=1.2017, or 20.17% haste. If someone popped Bloodlust, it would take us to 1.1444*1.05*1.3=1.5621, or 56.21% haste, well over our cap. For us, it’s more useful to work backward from 50% overall haste to figure out what rating we want to stop at. Since the bonus from Sacred Duty is included in the character-sheet values, I’ve given both “raw” and “character sheet” rating values on the table below. Note that the Seraphim values on the table are just 975/750 less than the associated buff value. For example, if it takes 3858 character sheet haste rating to hit 50% with just the Raid Buff active, it takes 975 less (or 2883) to hit it while Seraphim is also up. So if you want to hit 50% during Seraphim in that case, you’d stack 2883 and be below the cap the rest of the time. The raid buff is active in these sims, so we really only need 3858 haste rating on the character sheet to hit the cap. The profile only has 688 character-sheet haste, so we’re well below that. Even with Seraphim active, we have plenty of headroom for more haste. However, we’ll always be over the cap during Heroism, with or without Seraphim active. What this table really tells us is that we should stop stacking haste when we hit 3858 character-sheet haste rating, or about 42.87%. That’s a pretty steep target, so it’s not clear we’ll be able to reach it even in Tier 18. We’ll have to see how much ilvl inflation takes place from T17 to T18 and beyond to see for sure. This does, however, mean that you’d be well over the cap during Seraphim or Heroism. Note that TMI is fairly insensitive to that – your worst spikes tend to come when you don’t have either of those active, so it’s going to value haste highly if it’s helping you stay alive outside of those buffs. I think this is the more useful valuation of survival, though, because you don’t plan around the periods of the fight that can’t kill you. That said, if it offends your sensibility to be “wasting” (and I use that term very loosely here) haste rating during Seraphim, the table tells you what targets to aim for. Between 2883 and 3858 rating, you’ll be “wasting” some of the haste rating granted by Seraphim, so you could stop at 2883 and start focusing on other stats. Again, I don’t think we’ll get there any time soon, but worth throwing out there, primarily for those that are considering ways to push their DPS higher. If you’re going over the cap during Seraphim, then that haste is wasted from the perspective of doing more damage. Note, however, that the DPS scale factors provided earlier in this post automatically include the reduction inherent from heroism. In other words, haste is still our best DPS stat despite the fact that it provides almost zero extra DPS during heroism in this gear set. 1) Even a “quickie” Theck blog post is 2300 words. 2) Haste rules the roost. Stack it up to 50%, being aware of the haste-cap limits provided in the table earlier in the thread. This entry was posted in Tanking, Theck's Pounding Headaches, Theorycrafting, Uncategorized and tagged buffs, haste, Holy Shield, Min/Max, raiding, Scaling, simcraft, tank, tanking, theck, Theorycraft, theorycrafting, TMI, warcraft, WoW. Bookmark the permalink. Damn good feeling sir. Thanks for everything you did you make this happen. They didn’t implement the Sacred Duty buff or the Alabaster Shield nerf yet (as far as I know). According to the notes, those changes, as well as the Blood Boil nerfs *cheers loudly* are still in testing. If that’s true, then it may be worth noting at the beginning of the blog. Many people (at least in the MMO-C thread) seem to have read the notes and started gemming haste immediately. I hope it gets implemented soon. I’m super excited! Celestalon claimed that they are in-game, so we should be able to test if that’s the case once the servers come back up. I remember having 650 haste (6.5%) when I logged off yesterday, which is still the case in my Armory profile, so if that changes then we know they’ve been implemented. My server was up for 10 minutes the changes are live. Weird. It’s 3 days later and I’m still only showing 8.02% haste from 802 haste rating. Are you sure the changes are live on your server? Never mind. Looking at the wrong number. Live here too. Sorry, sometimes I’m kinda dumb. Damn it feels good to be a gangsta…. Again. I’m really excited to see where this improvement leaves me. It’s a bit disappointing about AS, but probably necessary. I will be swapping to haste gems once I know where my haste sits, I was at 10.35% Haste before the buff. Going Seraphim and probably back to Divine Purpose over Sanctified Wrath (my guaranteed HP generator) like I did in MoP. Honestly Theck, your blog makes it more fun to be a Prot Paladin. I can credit you, (my guild might say blame) with inspiring me to go out and tank. Thanks again! Do you happen to have the custom values for AskMrRobot for this new haste buff? These are the new defaults that I sent them. On the subject of weights, there is one thing that’s been bugging me for a little while now. Shouldn’t the weight for BA be roughly equal to the sum of Strength and Armor’s weights? Since bonus armor’s effects is basically both a 1:1 conversion to both armor and attack power? (the only difference would be that the ap from ba doesn’t benefit from any str multipliers such as BoKings). In other words, 1 point of bonus armor is the same as getting 1 point of armor and 1 point of ap, so shouldn’t it’s value be the combined value of those things? But it seems to come out behind that mark. I’m not saying that BA needs a buff, just that the weights don’t add up (literally). I knew I should have double checked the weight of ap itself instead of strength. For a holy avenger seraphim build would this buff to haste bring the haste weapon enchant above or below the bonus armor enchant? Pre hot fix stat values didn’t come close to bonus armor where as haste is now a 2.4 scale factor vs a 3.68 bonus armor scale factor. Though bonus armor is still higher the uptime on the black rock enchant is no where near the other enchants uptime a sometimes a 20% black rock uptime vs a 50% another enchant. Would this difference in scale factors and uptime result in a overall better use of the haste enchant? It’s entirely possible, but I don’t know yet. I’ll be running the glyph and weapon enchant sims overnight, so I should have answers to those questions by tomorrow. I also had a comment/question regarding Blackrock, not sure if this is the best place or not, but here goes anyways. The one day when I was doing my garrison stuff (I forget if I was in the garden or mine), and a mob spawned (one of the low health ones) and I quickly killed it, and noticed I had a buff-proc, so I checked what it was and was a bit confused to see that it was Mark of Blackrock….even though I was at max health when the mob spawned and it barely even touched me. In other words, I very definitely got a Blackrock proc when I was nowhere near the 60% health requirement that the enchant is supposed to have. Your guess is as good as mine. I haven’t really tested the proc mechanic, I just took the developers at their word on how it worked now. Maybe it’s some weird bug where it automatically procs upon entering or leaving combat? Was going to ask exactly this, will wait til your sims are done. Thanks as always. In answer to your question, Blackrock probably still slightly better for survival, Warsong better for DPS. Differences aren’t large in either direction though, so use whatever you prefer. In terms of ES, how does your sim work, does it “twist” between the haste buff and the hot? or does it do all 3? That particular version twists all three. I have alternate versions that twist only two seals or none at all. Thanks for all the work you do. Even if I am massively disappointed as I’m a mastery lover and have disliked haste since it came out, its great to know what I should be doing to be the best for my guild. Thanks again Theck, you da man. I went through 2 key boards and developed a mild rsi during the MoP haste madness, so I sympathise entirely. Personally, I have more fun with less haste (regardless of class or spec) so I choose a mastery build. I know it’s now sub-optimal, but as our raid still kills the bad guys I don’t think it’s a big deal. I run a Master>Crit=Haste Build with Holy Shield. I noticed when I ran Haste>Mastery>Crit with Seraphim post-hotfix, that I had worse Active Mitigation, even though I could get SotR up more often, when building up HP I was just getting smashed by bosses and burning CDs sooner than intended, the current build I’m running is overall much smoother in my opinion. A lot less spiky and a lot more predictable. I also think I can get SotR up more often. I join other ppl and thanks you for your work. I will ask you a question. At current Mastery and Haste seems to have pretty near value, since increasing your haste give you more HP and this increase the effectivness of mastery, could be that we reach a point stacking haste (prior to 50% cap) in which Mastery value rise above haste value? In other words could be that we have not a simple Haste>Mastery but instead an Haste/mastery optimal ratio? It’s possible, because haste and mastery do synergize in that way. I don’t think we’ll be able to stack enough haste to reach that point (if it exists) in T17 though. It’s something to keep an eye on for later tiers. Amazing work, just wish someone would do the same thing for rets. Thanks for the info though, will help me tank. I wasn’t sure if I missed it in your post. I see how to change the value for particular spells. How do I change the scaling of the global haste state? I’m not sure there’s an easy way to override that. I know where it is in the SimC source files, but that’s unlikely to be of much help. It’s easier to just adjust the Sacred Duty coefficient appropriately (or wait for a new version of SimC to be released – one should be up tonight, if it isn’t already). Thanks very much for your work. As xpyre27 said, I wish there was a comprehensive resource like you for Brewmasters. Up until now all the mastery+haste geardropping from highmaul was downright annoying. I’m far from a mythic raider, so have to take what junk i can get! Since haste now is again our main stat, i think there is a need to discuss which weapon enchantment is the best between Mark of Blackrock (MoB) which give armor bonus or Mark of Worsong (MoW) which give Haste. I hope the data on which i do the analyses are correct since the bad habit of blizz of not correcting tooltips. MoB 500 armor for 12 sec with a 40 sec ICD and a 100% Proc when under 50% healt. For MoW it is simple 1000 haste scaling over 20 sec with a PPM of 1.15 means an average of 210 haste which assuming the value Theck gives to AskMrRobot are equal to 126 Armor Bonus. For MoB it is a little tricky. Having MoB up for 12 sec every 40 means a 30% uptime so an average of 150 armor bonus, but this happen only when we are under 50% healt. If we have to stay over the equivalent value of 126 given by MoW we would need to be under 50% healt for more the 84% of the time of the fight, which i deem highly improbable. I am inclined to think MoW is better then MoB, i am missing something? I’d also like to know if this is viable. MoB doesn’t feel as beneficial any more, especially if they are bringing Seraphim to 750. While I like the proc of bonus armor, if haste gives us a better or an equivalent Bonus Armor on a quicker proc, especially if we already have good haste to begin with, then I would sooner go to this over MoB. Your model isn’t exactly correct. The trigger for MoB is when you drop below 60% health now, and any damage event that leaves you below 60% will trigger it, even if you started out below 60% to begin with. So if you’re actually tanking a boss, it will proc very shortly after the ICD is up. In short: both are viable, MoW is probably better for DPS, MoB is probably better for tanking. could you update the haste rating table to account for the Seraphim nerf please? or has this already been done? Oh, good point. I’ll do that shortly. in 6.1 I noticed that Discipline Priests will be receiving a unique buff that will greatly benefit with them running with a paladin tank. Shield a friendly target, absorbing [(((Spell power * 5.1) + 2) * 1)] damage. Lasts 15 sec. While the shield holds, spellcasting will not be interrupted by damage. Once shielded, the target cannot be shielded again for 15 sec. Also grants you Borrowed Time, causing you to gain 40% more of the Haste stat from all sources for 6 sec. the 40% haste applies on the casting priest. so how does this benefit us? Misinterpreted information, especially since it does not state which target receives that buff. At least when I read also grants “you” that it was referring in addition to the bubble effects. Hi Theck. I have followed your advice for years and want to first and foremost thank you for what you do for not the protadin community, but the entire wow community benefits from your work. So thanks. Again, thank you for all your work. I noticed that my DPS has lowered as well. I used to be able to pull anywhere between 30-100K on group trash (depending on size of group of course) and on bosses it was around 15-25K. Now I see number fluctuations of 13-30K on trash and 12-17K on bosses. It feels like they nerfed our output without saying so, I never glyphs into Alabaster Shield before nerf. My co-tank is a monk and this decreased damage makes it real difficult to pull mobs off their Ox statue at times, especially can be problematic for boss encounters. Self healing was nerfed for us and now damage, a 7 second taunt isn’t going to cut it when it comes to threat gain. The Seal of Truth nerf was a pretty big deal. It was sometimes upwards 10 percent of my damage. Haste lowers your Holy Wrath CD so that’s why it has a higher value. I mean maximizing your dps on each fight is so different. Depending on fight length HA maybe better. I only ever felt like I needed Holy Shield when I was about 660 ilvl on our first Brackenspore kill and for M Imp where I collected the adds, outside of that you should get comfortable with Seraphim if you can and you will see a dps increase. Sorry for the double post but I just noticed your progression. You should really test out Seraphim on Heroic Farm. Definitely mess around with HA and Seraphim on Heroic Butcher Farm. Also do you have a better “dps” trinket than pillar of earth? PBE or the Mastery one are better dps and still good for survival. Yeah our team has not attempted any Mythics yet, but we probably won’t with BRF coming next week. I was running Seraphim for our entire heroic progression, it played well up until we got to H-IMP and then decided to go back to mastery>haste. I’m not too worried about my overall DPS, but I have seen an improvement on my last H-IMP attempt with Holy Shield on the add phase collection. Doing HA might be more beneficial right now with HS, so Ill try that over Holy Wrath since my haste dropped a few %’s. I think there’s a lot of people that are relying on Seraphim for the bulk of their output. Relying on any talent for the bulk of your output is always bad. The bulk of the output should be from a solid rotation. When I move my cursor over Sacred Duty, it reads: You gain 5% more of haste stat from all sources. Yes – it still reads 5%. Is it just me, or Sacred Duty still gives 5% bonus? Tooltip changes need client side patches. This was changed in a hotfix, so tooltips aren’t updated. If this is so, then I am inclined to think that Haste is STILL underperforming significantly. Tooltip might not show the actual 30% boost, but the [character sheet] should, right? I actually do much worse when I stack haste as opposed to when I stack mastery or crit. I have to wonder why. Brasudas: I was thinking about going back to mastery gems and just doing haste enchants, I don’t see with all of our big nerfs that it’s viable to roll straight haste. Even though we received the boost, blizzard doesn’t want us to stack haste like that and ignore the other secondaries as we have been. Seraphim is under preforming, in fact I think I saw better results from Holy Shield before swapping to Seraphim pre-hotfix. They also want us to use Empowered Seals, it just makes the whole rotation more complicated than it should be. I basically stayed away from Haste for the past few days in favor of Mastery, Crit and Multistrike – and the result was substantially better. I haven’t used Seraphim or Empowered Seals – so I don’t know how that works. To me, Holy Shield seemed like the best out of the three, as it gives you a steady damage reduction without needing any micromanagement; the ability to block spells is a nice bonus too. I dropped back down from 19% to 16% haste and brought my mastery back up to 15% unbuffed. I also am going back to holy shield, I would love to just focus back on SoTR up time. Seraphim feels under-performing and Empowered Seals is too tedious to be a viable rotation. I’d rather keep the extra 15% block, spell block, and damage reflection. Hi Theck. It’s great reading your posts. With Blackrock coming out do the T17 set bonuses make Holy Shield better than Seraphim? There seems to be a lot of synergies with it. Beginning to wonder this my self, it feels like our set bonus is geared towards block chance and Holy Shield grants that solid 15% in addition to whatever your stats are. From logs of Heroic and Mythic testing with 2 set it’s around a 58ish percent uptime. So no matter what talent you choose this will always be helpful. In terms of the 4 set, it’s around 16-20 percent uptime. I do not believe you should be in the mindset “oh I have 4 set I should use Holy Shield on every progression fight” because that’s not going to be the case. Hi Theck and fellow paladins. I have recently retaken the role of the holy knight the protection paladin and for that reason i have been actively following your blog theck, and the various forums to get back up to speed. I am no math wiz or anything, in fact i consider myself rather below average on that part. However i have done my best to put together a loot sheet so to speak. It started out as a personal list so i had a breakdown of what items to aim for in Blackrock Foundry as we finaly are at a place where we can begin mythic raiding despite being only 3 months old guild. Since then i added your haste table and worked it into my own table, to see how much haste i was lacking untill reaching the cap. At the same time grew to include stats and 3 tabs; Current gear > 680 > 695. Reflecting the progress that we will have. I was hoping Theck, or any other well informed paladins would have a look at my stuff. I’m not really sure what you want me to check about that sheet. Took a quick glance at the haste math (which seems right), but that’s about it. I don’t find best-in-slot lists all that useful, so I don’t really have any feedback on your gear choices. The math is exactly what i wanted you to confirm, since i’m really bad at math. i looked at how you did it and worked out whatever you see on the sheet. I actually found myself having fun doing this. I agree on best-in-slot lists tho, i have never used one before. i just figured that since my list is very specific to my current gear as an “upgrade list” that if the math was right it would support those upgrades. Thanks for confirming the math. I still have a lot to learn about my protection paladin and hopefully i’ll be the one helping others some day. I am an extremely grateful for your job, Theck. Thank you very much. You create very interesting and useful stuff. P.S. : Why you use Dirac constant as your avatar? P.P.S. : Do you have the attitude to mathematics in real life? I have a Ph.D. in Physics, which should answer both of those questions. The set bonuses aren’t strong enough to have a significant effect on secondary stats. They’ll make mastery (very) slightly better than it is, but haste should still be better. It definitely props up Holy Shield, to the point that it’s probably a slightly more defensive choice than Seraphim once you have the set bonus. On the other hand, Seraphim will still do significantly more damage. Ultimately you’ll still choose the talent based on the encounter. There are certainly encounters where you’d prefer the cooldown coverage of Seraphim to Holy Shield just due to mechanics (Kromog is one example that comes to mind). I’ve done Kromog with Holy Shield. Our team makeup has a disc priest in it using Clarity of Will on every Slam, the rest of the fight is cake as long as it’s handled.